Who are the key influencers in your industry on Twitter that you need to connect with? Identifying and building relationships with influencers has numerous benefits – you’ll get your content shared, reach new audiences, form partnerships, generate business, and more. But before you go off and build those relationships, you need to put in a bit of work first to identify who those influencers are. 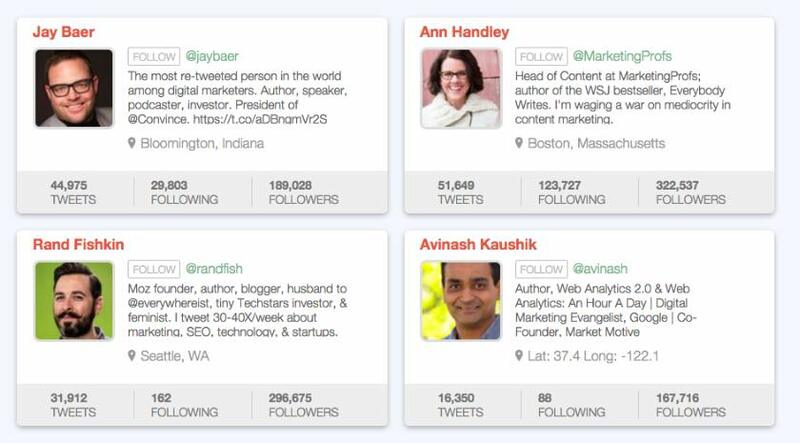 Of course, we have some useful tools that will help you find relevant influencers on Twitter. Klear is a powerful tool for analyzing Twitter accounts (it also supports, YouTube, blogs and Instagram). It divides people into over 40,000 categories so you can really drill down and find the right people in the right categories. You start off by searching for influencers based on category, and then you specify the country (this is optional). Klear will then return a list of search results. As you can see from the screenshot bellow, on the left hand side you can filter the results based on a range of criteria. Filter by location – You can break it down by country and then by state within the country. Filter by network – Although you want to find influencers on Twitter you may want to see if they have influence on other platforms too. Filter by skills – Based on the original filter, Klear will identify other related skills that you can check to filter the results even further. Show only – Sometimes you may want to show only influential people and exclude companies, or you may want to show more active or more responsive influencers, etc. When you identify the relevant influencer you can view a full profile of that influencer and start tracking them. I recently tested out Little Bird and was really impressed by the results. This tool identifies influencers by looking at how many other influencers are connected with them. It makes sense that, if you’re influential, other people who are influential will follow and engage with you. It’s always good for finding influencers based on a niche. 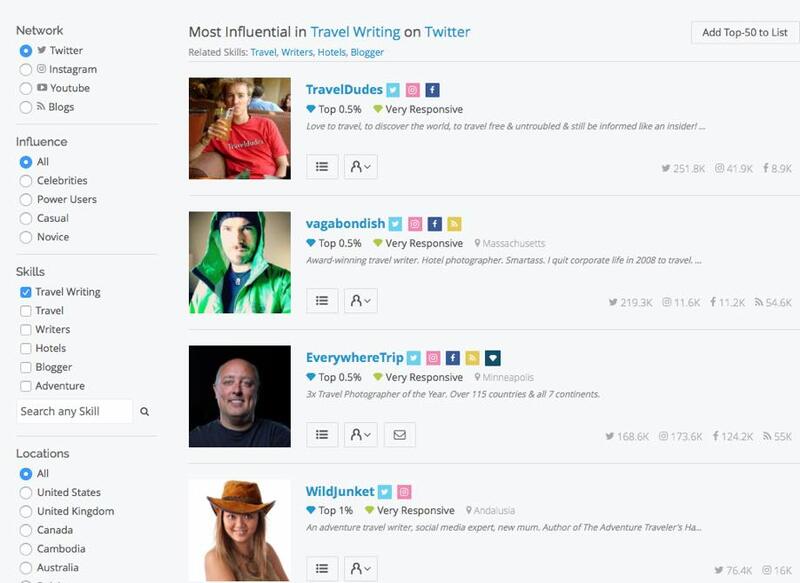 Popular content – When you identify an influencer list, you can see the most popular content they share. This is probably going to be great content for you to share out also. Discover people to connect with – Based on your influencer list, you’ll find out who you are not following that you should be. So it’s a good way of identifying new, relevant people to connect with. Blogs – You can browse through the latest blog posts by the influencers. Country filters – You can filter your influencers by country if there’s a specific country you want to target. Export reports – You can export the reports you produce (this depends on your subscription level). Buzzsumo is primarily a content research tool, but it also has some pretty great functionality that will help you find influencers. You can run a search to find the most relevant people based on a topic or a keyword and you’ll get a list of influencers with their Twitter handles and bios. From the screenshot bellow, you can see that on the right hand side you’ll get information such as the number of followers, the retweet ratio, reply ratio, average retweets (not all shown in the image), domain and page authority. You can click on each column to sort the results based on these columns. 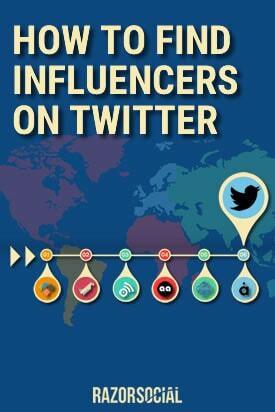 When you have identified the relevant influencer, you can add them to your influencer list. Traackr is a complete influencer management tool that you can use to find influencers (or upload them) as well as to track your engagement with them. 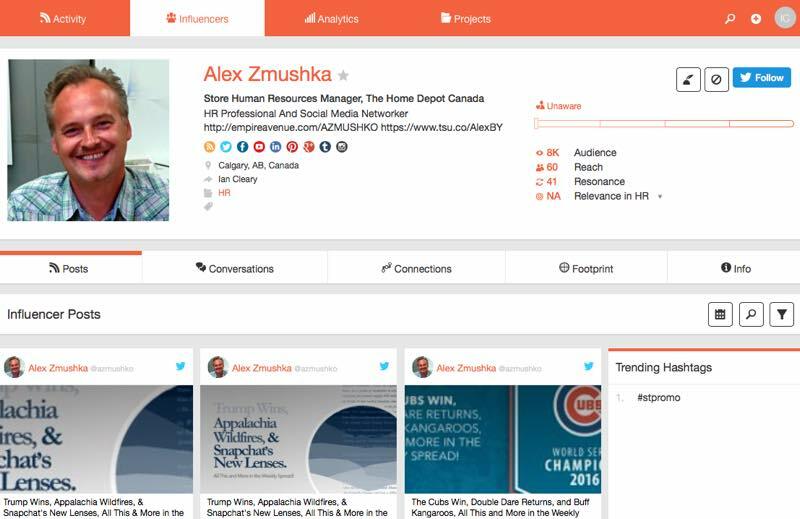 Here’s an example of an influencer profile which is automatically built within Traacrkr. 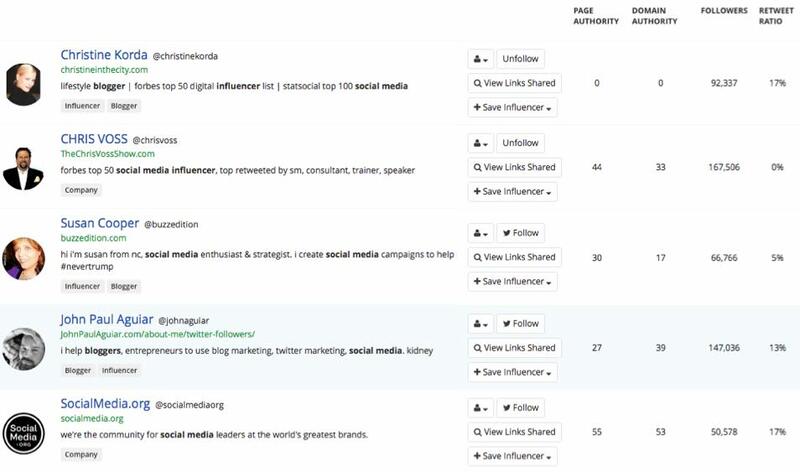 You can see that the tool picks up the profiles across social media for the influencer, posts, conversations, connections (i.e. connecting with other influencers), footprint (size of profile across multiple sites), and more! When you are communicating with the influencers you can monitor the relationship status so you know at what stage you are at with each influencer. 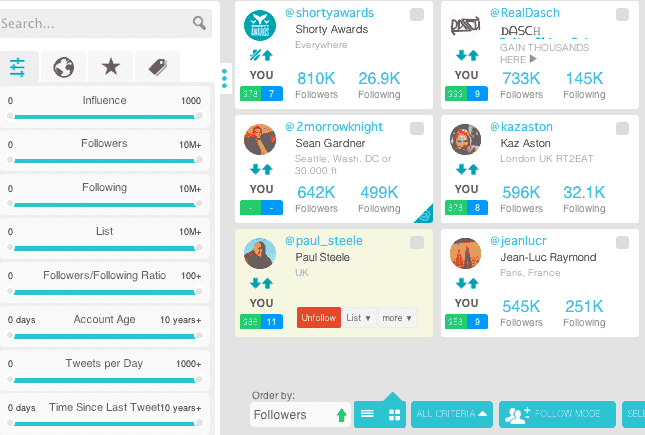 Twitonomy provides very detailed profile information on Twitter followers. If you find an influencer and want a very detailed profile analysis, this is a very useful tool. 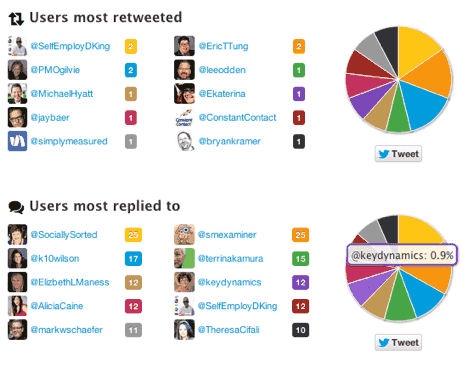 But here’s what I really like about Twitonomy – it enables you to find more influencers by looking at who your key influencer talks to/mentions on a regular basis. You’ll basically find more relevant influencers by following a trail. When someone becomes influential, they cannot possibly reply or interact with everyone. Imagine following 100,000 people and trying to keep up! So what they typically do is create a filtered list with people that they do want to interact with regularly. They share their content, reply to their tweets, and thank them for sharing their content. So, finding out who they are talking to regularly is a good source of influencers. These may be high-profile influencers, but it may also be people who are not yet that high profile, but are being watched by the influencers! These are the up-and-coming influencers and/or people who have access to the influencers, so it’s worth connecting with them. Audiense provides great filters for searching Twitter users. You can search profiles based on the keywords in people’s bio and location, and then sort this list based on a variety of categories. The influence filter is based on an influence-scoring mechanism called ‘Kred’, where people are scored on a 1-1000 scale. This is not a perfect rating system (neither are similar systems like Klout, Peer Index, etc.) but this score, together with other filters applied, can help find some great people worth connecting with. For example, you could show people who have a Kred score of above 800, who appear in over 1,000 lists, and who have 5 times more Twitter followers than the number they are following. The 6 tools we talked about in this article are all very useful, but there’s also an effective way to find twitter influencers without leaving the platform. I’m talking about Twitter lists. Many people create lists on Twitter and add influencers to those lists – these could be bloggers, journalists, industry thought leaders, CEOs, etc. Find a top influencer in your industry on Twitter and, on their profile, click on “Lists.” Here you will see the lists they follow and the lists that other people added them to. Going through the Twitter lists your top influencers belong to is one of the fastest ways to find new influencers to follow and connect with. One of the best ways of achieving success online is building relationships with people that have an active and engaged audience for the niche you are targeting. In particular, you want to find and connect with the influencers. There are many tools to help in this area and all of them have their merits. Which tools do you use to find influencers and how important is it for you and your business to build relationships with them?